Former Fulham and Reading striker Pavel Pogrebnyak is currently in the centre of a race row, following comments regarding non-Russian players receiving Russian passports to make them eligible to play for the national team. The 35-year-old played 33 times for the Russian national side between 2006-2012, earning 33 caps and scored eight goals before then being dropped indefinitely in the aftermath of Euro 2012. Pogrebnyak moved to the Premier League in 2012, joining Fulham on loan for the second half of the season and scored six goals in 12 appearances for the Cottagers. The striker went on to join Reading on a permanent deal the following summer, spending three years in Berkshire where he netted 26 goals in 103 games for the club. He has since returned to Russia, spending the last four years of his career in the Russian Premier League but has since made the headlines for all the wrong reasons. Pogrebnyak has described it as “laughable” for black players to be considered to play for Russia, comments which have since been condemned by Mikhail Fedotov, who is head of the presidential Human Rights Council for Russia and said the comments ‘smell of racism’. "I believe that any football player who plays well and has Russian citizenship has a right to represent the Russian national side," he said. It was in response to Pogrebnyak’s full soundbite, which saw him pick out CSKA Moscow’s Mario Fernandes and Krasnodar’s Ariclenes da Silva Ferreira. Pogrebnyak could now be handed a 10-match ban for his comments according to reports in Russia, while the deputy anti-discrimination officer for the Russian Football Union says they are looking into further punishment for him. The veteran forward has since attempted to clarify what he meant with his comments, saying: "I do not have anything against black players. In the interview I voiced my strictly personal opinion that in the Russian national side I would like to see footballers who were born and raised in our country. That is all. I did not mean to insult anyone." 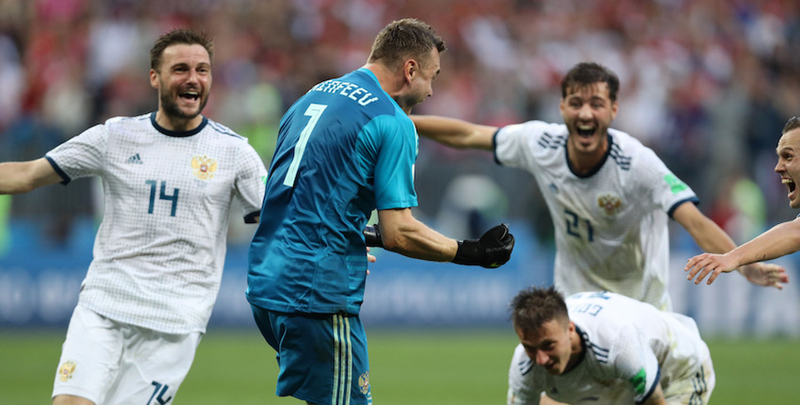 Russia enjoyed a successful time as World Cup hosts last summer, reaching the quarter-finals before being eliminated by eventual runners-up Croatia.